SAN FRANCISCO -- The Giants believe they can bounce back from a last-place season behind one of the best rotations in baseball. It starts with Madison Bumgarner. 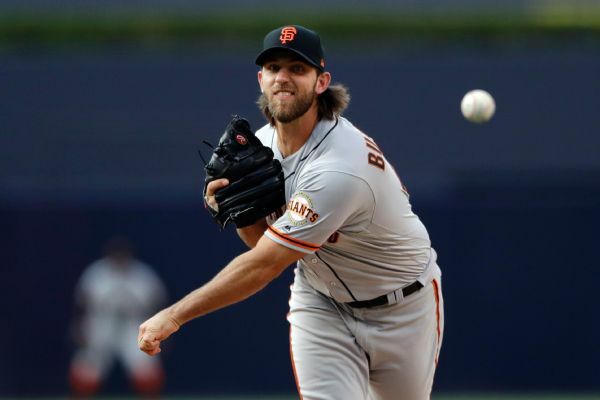 MadBum's $12 million option was exercised by the Giants, who are determined to keep a talented rotation intact. "It's our bread and butter," executive vice president of baseball operations Brian Sabean said Monday. "We're very excited about the workload that hopefully they can take on and endure through next year. It's really a must for us. Our starting pitching has been a mantra. We also know we have to fortify the bullpen. We look at last year as an aberration, a lot driven by injury." San Francisco locked up Bumgarner long-term in April 2012 on a $35.56 million, six-year contract through this year. The deal with the 28-year-old includes another $12 million option for 2019. Bumgarner missed nearly three months this season following a dirt bike accident during an off day in Colorado on April 20. The 2014 World Series MVP went 4-9 with a 3.32 ERA in 17 starts and 111 innings after double-digit victories in each of his previous six seasons, including 18 each in 2014 and '15. Third baseman Pablo Sandoval, the 2012 World Series MVP, had his option exercised for the $545,000 minimum. That figure will be offset against the $18 million he is owed by Boston. He signed a $95 million, five-year deal with the Red Sox after the 2014 season to depart San Francisco. As of now, the Giants don't consider him the everyday third baseman going into 2018. As planned, San Francisco also exercised the $7 million option for lefty Matt Moore. He was 6-15, a career-high losses, with a 5.52 ERA over 174 1/3 innings. He allowed a career-high 107 earned runs. "It's just a matter of making sure we use the right pitches at the right time," new pitching coach Curt Young said. "He went through a little bit of a struggle last year. I'm sure he's the type of pitcher and type of person who wants to get back and be on top." Right-hander Johnny Cueto declined to opt out of his contract after a season also limited by injuries. He had the choice to leave after the second year of his $130 million, six-year deal signed before the 2016 season. "It's a big piece of the puzzle," Sabean said. "We didn't say it was a coin flip in our minds but you have to be prepared for the worst." The team formally announced Monday the hiring of former Athletics and Red Sox pitching coach Young to replace longtime pitching coach Dave Righetti. Also on deck is new hitting coach Alonzo Powell, who was Houston's assistant hitting coach. Powell replaces Hensley Meulens, who has been promoted to bench coach. Both Righetti and Meulens offered their respective recommendations on the hires. The Giants interviewed Powell between Games 2 and 3 of the World Series won by the Astros over the Dodgers. "You have to look at what's happened there in Houston and he's been a big part of that with their hitting philosophy," manager Bruce Bochy said.